Importing your Paylocity time export file into WebPay. You will have an export file from Buddy Punch that is specific to Paylocity's WebPay. You'll import that file into WebPay. After you've setup your Paylocity settings in Buddy Punch and have your Paylocity Export File saved from Buddy Punch to your computer, you'll need to import that file into WebPay. First, sign into WebPay and go to Payroll --> Payroll Entry. 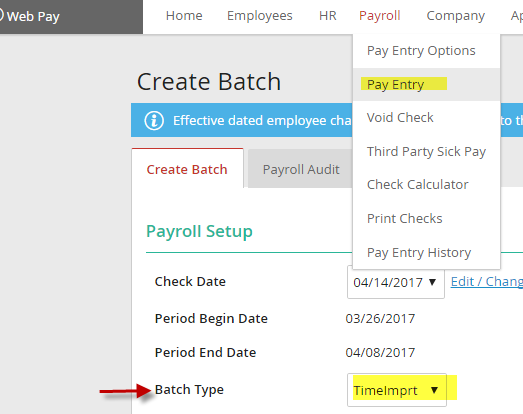 From the drop down select Batch Type and then Select "TimeImprt." Then click on Add Batch. You'll then get options on using a time import file for your batch. If you already have an existing batch you can merge into your existing one, otherwise you will create a new batch. You'll also see options for your Time Import File. You'll want to choose the upload option and upload the file you received from Buddy Punch. After you have uploaded you'll see an Import button on the bottom left. Click to import. You will have the option to review the Status Report which will allow you to continue and import, or tell you if you have any warnings or errors and allow you to correct them. Errors will not import. Once you have checked all errors and warnings you can choose to Ignore Errors and Import, if appropriate.